We've long been aware that humans are far from the only intelligent animal. Our close cousins the chimpanzee and gorilla have been much studied, and some have attained the ability to communicate with sign language, even putting together signs to make a sentence. The chimp Washoe, seeing a doll in one of her drinking mugs, famously signed "baby in my cup." Other animals noted for their capacities include dolphins (and cetaceans generally, a group that includes dolphins and whales), although no mutually convenient means of communication has yet been found, and parrots are often noted for their mimicry of human speech, which sometimes seems to evince novel utterances. The dog, of course, has long been a companionate animal, and in one case -- a border collie named Chaser -- has been shown to have a vocabulary of more than 1,000 words, though here we're talking about recognition rather than the ability to produce them. But the pig has long been known to be highly intelligent, with some owners of domestic pigs claiming that they are far more so than dogs. 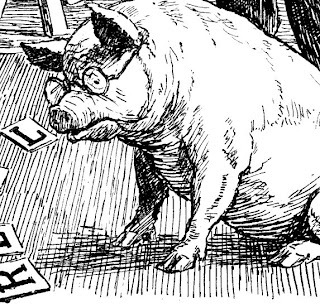 Recent studies have begun to document this capacity, with one -- led by Donald Broom of Cambridge University -- showing that pigs, once accustomed to them, were capable of using mirrors to find food, although they did not go in for staring at themselves. Mirror self-recognition has been documented in chimps, and some hold it a benchmark of sentience (personally I think this simply means pigs are less vain). Pigs are capable of learning all kinds of behaviors, and, according to Suzanne Held of the University of Bristol, once they learn a task, they remember it -- in fact it's difficult for them to unlearn it. Perhaps all this should come as no surprise -- pigs are, science has found, somewhat closer to us genetically than we'd realized; Dr. Lawrence Schook of the University of Illinois, who sequenced a rough draft of the pig genome, was quoted in the New York Times as saying it "compares favorably with the human genome." Large sections of it are, in fact, nearly identical, which correlates with various observed similarities, such as pigs' teeth and hearts. Pigs are not nearly so close to us as chimps (who share 96% of our genome), but they are cousins of the cetaceans, and perhaps this correlates with their similar intelligence. Further studies may tell us more -- and I can't help but wonder what might happen if, just as was the case with Toby, a pig were given the chance to manipulate letters or other signs, and use these to establish a means of communication. Thanks for this -- and yes, I've heard similar things about crows and ravens. Well, when you think about it, if indeed birds are descended from dinosaurs, then they have had a good deal more evolutionary time to develop intelligence than has poor homo sapiens sapiens ! Loved your piece on crows, and also the Radio 4 podcast! Canongate Books channel, now featuring excerpts from Simon Callow's audiobook version! All original contents of this blog are © 2011 - 2014 by Russell Potter. All rights are reserved, and no material from this site may be reproduced in any form without permission of the author.